Concord Adex’s Parade towers in CityPlace, and the latest addition to Toronto’s downtown skyline are now linked together. The Parade towers themselves were used as cranes to hoist the bridge. Before each was sealed off, beams were installed at the top. When it came time for the hoist, the beams were pushed out and cables attached. “Safety was a huge priority,” said project manager Jeff Wilkinson, recalling the tense hoist process. As residents of the condo community of CityPlace turned out to watch, the SkyBridge was hoisted in place. When complete, its first floor will contain a common amenity bar/lounge that will feature glass floor panels, offering a straight-down view that is “scarier than the CN Tower,” Mr. Wilkinson says. “I’m not aware of anything else like it in North America – a residence on a bridge,” Mr. Wilkinson adds. SkyBridge length: About 40 metres. Height: About seven metres, or two floors. Parade towers height: 38 and 49 storeys. SkyBridge occupancy limit: 100 people. Design architects: KPF Architects, New York. Working drawings architect: Page & Steele / IBI Group, Toronto. 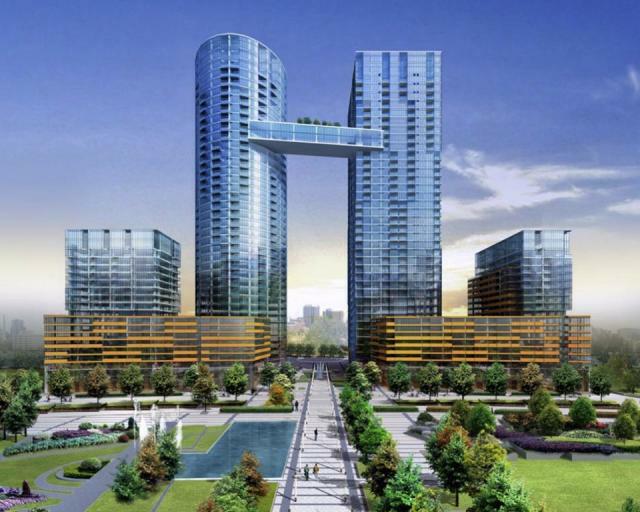 Construction company: PCL Constructors Inc.
Concord CityPlace condo development: 20 towers with seven more to be built between the Gardiner Expressway and Front Street West.